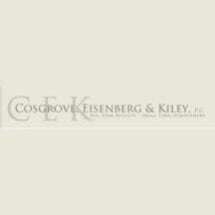 MoreCosgrove, Eisenberg and Kiley, P.C. is a Massachusetts Professional corporation engaged in the general practice of law with concentrations in litigation and governmental law. Its offices are at One International Place, Suite 1820, Boston and 803 Hancock Street, Quincy. Its attorneys are licensed to practice before the state and federal courts in the Commonwealth and are members of the Massachusetts Bar Association as well as the Norfolk County and Quincy Bar Associations...Cosgrove, Eisenberg and Kiley, P.C. is a Massachusetts Professional corporation engaged in the general practice of law with concentrations in litigation and governmental law. Its offices are at One International Place, Suite 1820, Boston and 803 Hancock Street, Quincy. Its attorneys are licensed to practice before the state and federal courts in the Commonwealth and are members of the Massachusetts Bar Association as well as the Norfolk County and Quincy Bar Associations.